Sand 'N Sea Cottage - Gulf View! FREE Beach Serv. In Season Mar - Oct! * 95 steps to the beach! * a one minute walk to the gulf! Welcome to the sand 'n sea cottage! This lovely beach retreat cottage is a three bedroom w/ bonus bunk room , 2007 sq ft., beach cottage. It is located in the private gated community of beach retreat in beautiful Miramar beach on scenic gulf drive. This cottage is the only one in beach retreat cottages that has a gulf view! Just steps to the crystal sands of the gulf, it is ideally located for restaurants, shopping and entertainment. Built in 2005, we have professionally decorated this house with our enjoyment and yours in mind. The furniture, appliances and the flat paneled TVs in the living room and bedrooms are all new. This home has new furniture, paint and access pieces as of Jan 2012. 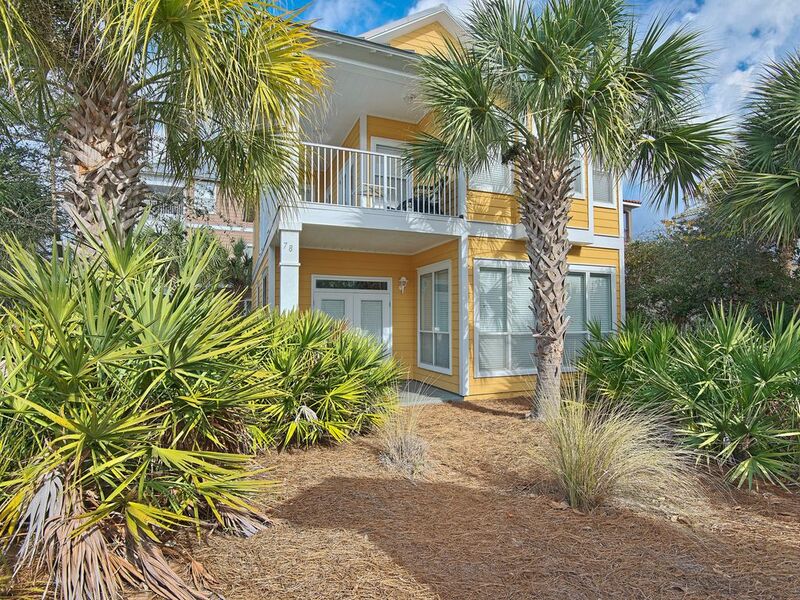 This adorable 3bd w/ bonus bunk room, 3 bath beach cottage is just a short stroll to the beach. This is the only cottage in beach retreat that has a gulf view! After the pool or beach, you can relax on the 2nd floor balcony where there is seating for 4 while you enjoy your favorite drink you will enjoy sitting in the evening breeze watching the waves after a fun day in the sun! When you are ready to head to the beach, relax! We'll provide beach service ( two beach chairs and an umbrella ) during your stay ( march 1 through October ), or you can take a dip in the 3,000 square foot, heated ( seasonally ) pool with a hot tub attached or workout in the private fitness center. All just steps away from the house. .
Should you wish to explore what the local area has to offer, you'll find an abundance of choices. Sidewalks line scenic 98 for walking, running or bike riding. We are a short 2 mile drive to the silver sands mall to the west, or luxury shopping at Destin commons to the east. Kenny d's, the crab trap, and pompano Joe's are all within walking distance to cayenne cottage. We encourage you to leave menus of your favorite restaurants when you come. The silver sands outlet mall is a vacation in it’s own right for shoppers you will have access to over 100 stores, including, polo, Ralph Lauren, banana republic, brooks brothers, Eddie bauer, liz claiborne, Tommy Hilfiger, Lenox, Nike and Reebok - just to name a few. When you need to pause for nourishment choose from panera bread, cheeseburger in paradise or carrabba's italian grill. More great shopping can be found at the Destin commons outdoor mall. Enjoy such great stores as Abercrombie & Fitch, Ann Taylor loft, banana republic, belk, books-a-million & Maui nix surf shop to rattle off a few. Stop for a bite to eat at the hard rock café, panera bread, tony’s ristorante or sushi siam. More than just shopping the Destin commons center plaza offers a soft-play kids playground and a 49-head pop fountain. Community activities and entertainment are held through the year at Destin commons. Rave motion pictures is also housed at Destin commons to catch the latest releases. Grande boulevard offers stores such as billabong, brooks brothers country club, coldwater creek, j. Crew-at-the-beach, sunglass hut, & tommy bahama's emporium as well as great dining at tommy bahama’s , fleming’s, cantina laredo (if you dine here sit outside to enjoy the fountain!) & mitchell’s fish market. The track amusement center in Destin, Florida offers mini golf, water bumper boats, go-carts & for those not faint of heart, bungee jumping. Big kahuna’s water park is a favorite for young & old alike. Take a break from the wonderful Destin, Florida beach & spend the day here. Don't forget our wonderful golf courses! There are (10) championship golf courses within four (4) miles of 'cayenne cottage'. Each offers its own character and challenges. All are public courses with full service facilities with a restaurant, practice range, rental clubs, professional lessons and pro shop stocked to meet your needs. Only cottage in Beach Retreat with a Gulf view! There is parking available for 2 vehicles only in front of the cottage. We provide a complimentary beach set up of 2 chairs and one umbrella for our guest during season. We have stayed in several cottages at Beach Retreat, but this was our first year to stay at Sand 'N Sea Cottage. It is very nicely decorated and well equipped for your stay. It's located close to the beach and pool, and we always enjoy having the beach set up as part of our stay. Thanks for a great week! Thank you for the lovely review! We always love having you as a guest as well! We had a wonderful time and our unit was in a great location! Thank you for taking the time to write a review! I am so pleased that you enjoyed your stay and I hope we hear from you again soon!!!! Can’t beat the location! The short walk to the beach was just what we wanted. The home was very clean upon arrival. I called Kathy the first day to ask a question and she immediately answered and was so nice and gave great information. You won’t regret choosing this place for your next Destin vacation. I am so pleased that you enjoyed your stay! I hope you will come back again soon!!! Lots of space and light. Loved the proximity to the beach. Especially loved the deck space outside of the Master Bedroom, and the kitchen. Thank you for taking the time to write this review! I am so pleased that you enjoyed your stay and I hope you will come back again soon!!! We stayed at this cottage with 4 adults, 2 toddlers and a dog (two families) and it was perfect! Each set of adults had their own master (one on the first floor and one on the second) which is nice for privacy and the kids had plenty of space! The second level patio was so nice and the main level had plenty of room to sit and relax as well as sitting down to enjoy meals at the large table. The walk to the beach took about 2 minutes and the walk to the pool about 30 seconds so it is great for access to both! Everything was really clean and nicely kept, we had no complaints! We would definitely book this home again. Thank you for this lovely review! The new outdoor furniture does make sitting outside so pleasant now! I am so pleased that you enjoyed your stay and I hope you will come back again soon!!!! We had such a wonderful time on our vacation. This cottage was very clean and had plenty of space for both family's. It is in a really good location as well. It's right across the parking lot from the large pool and right across the road from the beach. The property manager (Kathy) was great to work with as well. Thank you for this lovely review! I hope you will come back to visit us again soon!!! The Sand 'n Sea Cottage is located in the gated community of Beach Retreat. It is a short walk to the beach access with over 300 feet of beach frontage. This quaint community has paved streets and lined with colorful Florida Cottages. The community has a 3000 square foot pool that is heated part of the year. to the world's largest designer outlet mall, plus Destin commons which boast a Rave Theater, Hard Rock Cafe restaurant, dancing waterspouts for the children to play in and a build a bear workshop. Then there is the world class beaches to relax on! There is so much to see and do in Destin that you can be a busy or as laid back as you decide you want to be! My name is Kathy, give me a call! Golf: Of course we can not forget to mention Golf! Dont forget our wonderful Golf courses! There are (10) Championship golf courses within four (4) miles of Beach Retreat Community. Each offers its own character and challenges. All are public courses with full service facilities with a restaurant, practice range, rental clubs, professional lessons and pro shop stocked to meet your needs.